The impact of the Group’s business is clearly felt in the day-to-day life of communities around its farm and production units. While its business directly and indirectly supports the livelihood of at least 20,000 residents. The Del Monte family prides itself in giving back to the community. This has become our tradition since the first pineapple fields were planted in the 1920’s. To this day, Del Monte employees keep this tradition as we visit various communities. The Group’s employees volunteer their time to help make lives better for the less fortunate. As a responsible corporate citizen, the Group continues to contribute to the development and upliftment of the quality of life in communities where we operate. During the fall of 2017, DMFI quickly acted to deliver over 453,600 kilograms of food for Hurricane Harvey rescue efforts in Texas, Louisiana and Puerto Rico, as well as fire recovery efforts in California and to earthquake responders in Mexico. Additionally, each US-based manufacturing facility donates to local food banks on a regular basis. In 2017, their efforts resulted in over 3.6 million kilograms of food donated to food banks near where they operate. DMFI corporate offices in Walnut Creek, California; Rogers, Arkansas; and Pittsburgh, Pennsylvania also coordinated volunteer efforts to help pack donatable goods for local families in need near the offices. Our corporate giving programme reflects our values and we share these with the communities in which we operate. At Del Monte, we have a can-do spirit and we believe in using our quality products to change lives and make a real impact in our communities. 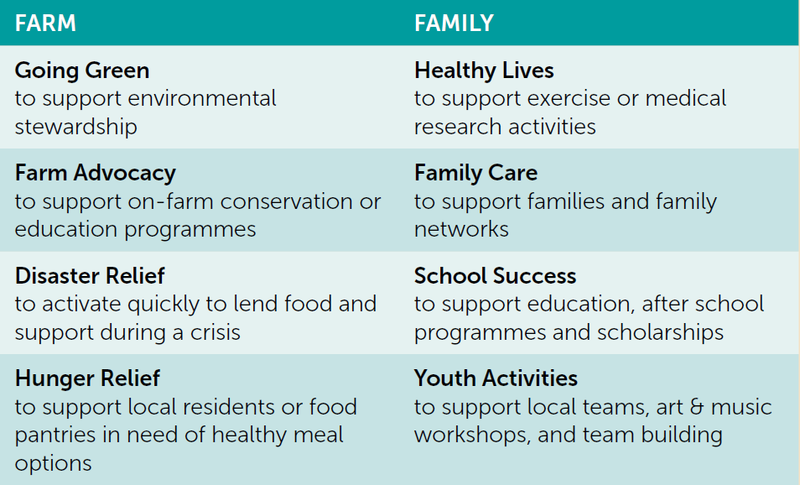 Through this approach, we identify and support local and national organisations that make a difference. 1. 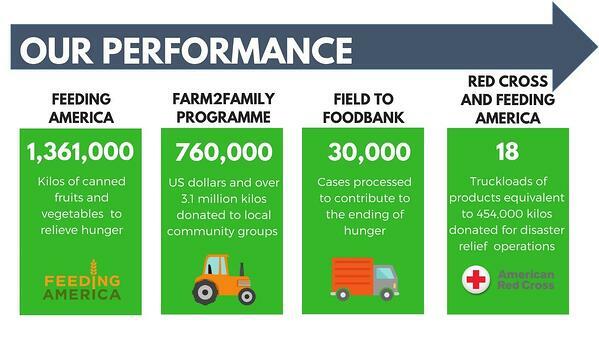 As part of our “Farm2Family” Corporate Giving programme, we strive to contribute to organisations that focus on farm advocacy, feeding those in need, environmental stewardship, disaster relief, education, youth activities, family care, and healthy living through financial gifts, as well as donating food to our communities where we can have the most impact. 2. Beyond hunger relief, our programmes also reduce waste such as our Brite Recovery Programme with Feeding America. Sometimes there are slight imperfections in fruits or cans during the manufacturing and labeling process. 3. Another source of waste typically starts at the field itself. When excess food is grown and cannot be sold, it is plowed under. Through a partnership led by the Wisconsin Institute for Sustainable Agriculture called Field to Foodbank, excess food is contributed to those in need through a collaboration between growers, manufacturers, and truckers. 4. To manage the challenge of supporting local food bank inventory needs, the unused fresh food is canned, helping to extend the shelf life and lock in the nutritional benefits. This system relies on multiple layers of generosity from the donation of the seeds, land, labour, cans, and processing. 5. Del Monte is proud to have been part of Field to Foodbank, in partnership with our growers, since its inception in 2008. During that inaugural year, Del Monte processed 3,000 cases, providing a robust proof of concept. 6. Finally, when disaster strikes, a quick reaction is key to help those affected. While the roads are still impassable at times, we ship our nutritious food to communities in need. We work with the American Red Cross and Feeding America to respond in real-time with pre-approved in-kind food donations for large-scale disasters, especially those affecting farms. 7. When hurricanes severely damaged parts of Texas, Florida, and Puerto Rico in 2017, Del Monte responded with 18 truckloads of fruits and vegetables equal to over 1 million pounds of food distributed in under three weeks to the affected regions. Del Monte Foundation, Inc, a non-stock and non-profit organisation in the Philippines, spearheads our efforts as we expand our reach in the local community. The Foundation employs a framework for identifying and selecting community projects, in coordination with the DMPI Plantation and Cannery teams. The Foundation’s mission is to raise the level of global health and wellness by bringing greater awareness on health, nutrition and food safety to our host communities. Through the Del Monte Foundation, we help address various community concerns on sanitation, health and wellness. 1. The Foundation supports Smile Train, a programme that provides free surgery to indigent children with cleft lip. 2. The Foundation participates in the Zero Extreme Poverty 2030 Movement (ZEP2030) as local convenor for Bukidnon, Philippines. ZEP2030 is an initiative of civil society organisations (CSO) that aims to uplift 1 million Filipino families from extreme poverty by the year 2030. As a local convenor, the Foundation is the lead organisation/CSO on the ground in-charge of facilitating the convergence of different stakeholders in the area as well as clusters/member organisations of the Movement. 3. The Foundation conducts community education sessions in localities pertaining to family values, health and nutrition, prevention and treatment of common illnesses, financial management, family planning and such other concerns relevant to the community. 4. Community health workers undergo continuous training supported by the Foundation so they could render better service to their constituents. Our Community Education Centre has official accreditation from the Philippine Technical Education and Skills Development Authority (TESDA) highlighting public-private sector cooperation for community education. Community-based skills trainings are also conducted to provide greater and easier access to technical education for the out-of-school youth and unemployed heads of families. The skills learned are used by the beneficiaries for employment or self-employment to augment their family’s income. 1. Free technical skills training courses are conducted in towns and cities in the Philippines. 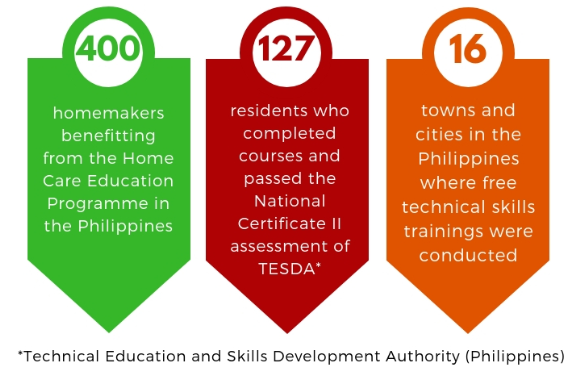 Training graduates take national certification exams given by TESDA and are assisted by the government’s employment office for job placement. Others opt to be self-employed and are given start-up assistance by the Department of Social Welfare and Development or Local Government Units (LGUs). 2. The Del Monte Foundation Centre in Camp Phillips, Bukidnon, Philippines continues to offer technical and vocational training on shielded metal arc welding, bread and pastry production and basic driving. 3. Del Monte Foundation implements its Home Care Education, a 5-month programme that teaches women proper nutrition, preventive health, family planning, herbal remedies, emergency care and livelihood skills, amongst others. 4. The Foundation initiates and supports new trainings through partnerships with government agencies and private organisations. 5. The Foundation has introduced fruit preserve making in cooperation with the Plantation Supervisors’ Coop and the Department of Trade and Industry to utilise excess supply of papaya. This provides livelihood opportunities for housewives in the neighbouring localities. 6. New courses like native beadwork and automotive maintenance servicing have been introduced. 7. The Foundation likewise partners with a local organisation for the identification of poor local farmers for a training in organic farming sponsored by TESDA. 8. The Department of Labour and Employment in Region-10 partners with the Foundation and TESDA whereby, amongst others, it coordinates and facilitates employment programme activities such as job fair, career coaching and other related activities involving the graduates of trainings conducted by DMPI. With this partnership, training graduates have more access to employment and employment assistance. 9. Del Monte’s PET Plant in Cabuyao, Laguna, Philippines assists local residents to enhance their technical skills through a collaborative programme with TESDA. Through the Del Monte Foundation, gifted children earn quality education from primary levels up to post-graduate studies through our academic, grants-in-aid and sports scholarships. 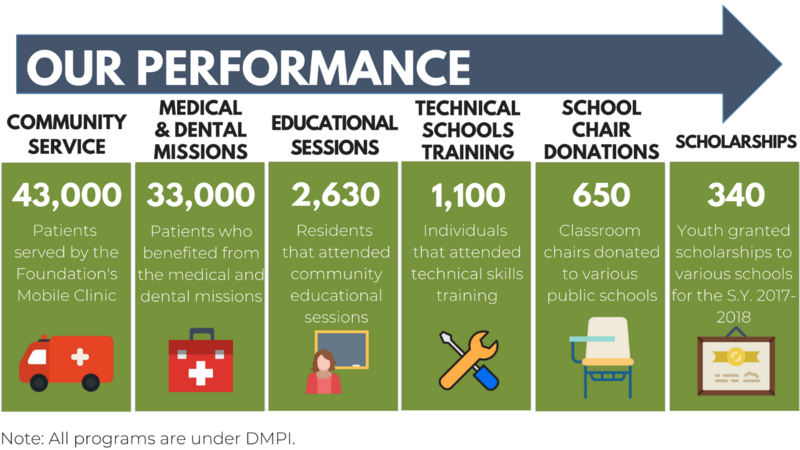 A scholar is supported in each of the communities where DMPI has operations. Aside from scholarships, we work closely with the community to harness the potential of the youth to lead and transform their communities into self-sufficient units for nation-building. 1. Consistent with our commitment to help the national government address the shortage in school facilities, i.e. classrooms and chairs, the Foundation undertook the construction of 2 classrooms in San Roque Elementary School and Lindaban Elementary School in two towns in Bukidnon, Philippines. 2. Public schools in 5 towns in the Philippines benefitted from the assistance extended by the Foundation during the annual school brigade. Materials to help restore classroom buildings and facilities were donated to make them functional and ready for the opening of the new school year. 3. Wooden pallets from DMPI’s cannery were also donated to the LGUs of 2 localities from which they produced additional school chairs. The Foundation promotes child development through the material assistance it extends to institutions that cater to the needs of young children. It donates various materials designed to help develop the motor, visual-learning and creative skills of pre-school children in 17 public elementary schools and 6 day-care centres. 4. The Foundation partners with the Labour Management Councils of East and Sumilao Crop Production Units for the organisation and implementation of inter-community sports tournaments. It likewise donates sports equipment to identified localities as well as playground equipment sets to 2 localities. 5. Community youth leaders also join Leadership Trainings after which they harness resources of their respective youth organisations to attain both medium-term and long-term development goals of their communities. 6. Foundation scholars and selected community youth leaders participate in the various trainings on leadership and values enrichment. 7. The Foundation has a campaign called “Help Send a Child to School” to provide an avenue for Del Monte employees to express the core value of ‘Commitment to Society and Environment’ via sponsorship of a high school scholar. It also aims to increase access to education of financially challenged but deserving students in the rural areas.